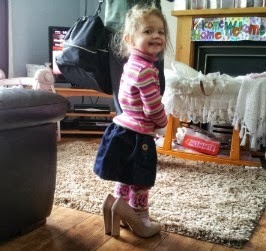 My Little Girl is a complete "girly girl" and today she happily posed for a photograph while wearing her Mammi's shoes. She then proceeded to walk around the lounge & kitchen wearing them. I think she loves the noise the heels make on the laminate floor. I can't help but laugh. Isabella Nicole in Mammi's shoes.